$99 down to qualified buyers. Stock #43785, Price $10,899 excluding tax, tag, and title. 180 weekly payments of $86.00 @ 21.9% APR with approved credit. APR listed is for illustrative purposes. 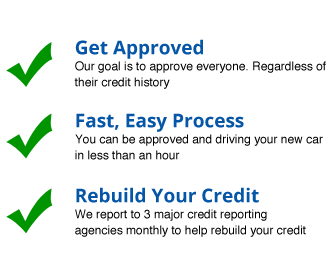 The APR for your transaction may be higher or lower based on your credit score. A $579 down payment is typical. Your down payment may be more or less depending on the price of the vehicle and your credit.